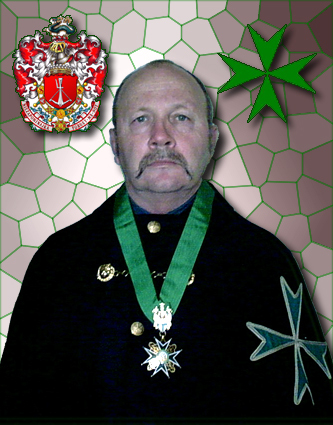 At the Annual Ceremony of the Order held in Auckland on the 29th of November 2003, Chevalier Mike Subritzky was installed as a Knight of Justice, in the New Zealand Grand Priory. He is the first Knight of Justice on the North Island, and second member of the Order to be awarded this grade of Knighthood. Chevalier Edward Roberts KLJ of the South Island Commandery is the only other New Zealander to be awarded the Justice Cross. Edward received his Justice Cross personally from the Grand Master. The Justice grade of knighthood, in orders of chivalry, is granted to those members who can prove direct descent from old noble families. In ancient times, the cross was referred to as "proving quartering." Mike is descended from two very old European families. On his paternal site, he is a direct descendant of "Fiedz the Tartar" who was ennobled for "valorous deeds on the field of honour" by His Majesty King John Albert of Poland in the year 1495, and granted the everlasting right to bear the Polish arms "KUSZA" (Crossbow). Fiedz the Tartar was a member of the immemorial Tartar nobility, and a descendant of Genghis Khan. The family is mentioned in more than sixty (60) armorials and they were the Lords of Zubr, Subocz, and Krasne Siolo in Northern Poland. On his maternal side, Mike is a direct descendant of the Irish O'Dowd Kings of North Connacht, and can trace his lineage through 44 generations. His ancestor Hath I, King of Connacht and Tara, was one of the first thirteen (13) Irish kings to be baptised by Saint Patrick. His Irish forebearers ringed North Connacht with 23 castles and held off all corners for many centuries, until the English invasion in the time of Oliver Cromwell. The last O'Dowd King (Taoiseach) was Tadhg Bui O'Dowd (1595-1682).